DIE Sabbati, 11 die Novembris. Message from the H. C. with Votes about Delinquents. Message to the H. C. for Committees to consider of the King's Answers to the Propositions. Grigson to be instituted to Panton. The Petition of Henry Trenchard, read. 2. Votes concerning Seven Delinquents to be excepted from Pardon. 4. An Order for a Fine of One Hundred Thousand Pounds to be set upon the Earl of Cambridge. 5. An Order for Persons comprized in the First Branch of the Proposition concerning Delinquents to be removed from His Majesty's Counsel, &c.
6. A Vote to banish Seven Persons. Ordered, To be considered of on Monday next. That they do agree to the Order for the staying of Doctor Brownrick: Touching the Ordinance concerning the Horse Guards, they agree to, with Amendments sent down to them: (Here enter.) And they agree to the Ordinance concerning Contractors with Amendments; to the rest, they will send an Answer by Messengers of their own. To desire a proportionable Number of their House to join with Seven Lords, to consider of the King's several Answers in this Treaty. L. Viscount Say. L. North. "The Lords have appointed a Committee of Seven Lords, and desire a proportionable Number of the House of Commons may be ordered to meet, and to consider of those Concessions that the King hath made to the Propositions, and to frame them into Bills; and likewise to consider wherein the King's Answers come short of our Desires in the Propositions, in those Things which are not granted in Terminis; and to report all these to the Houses, that they may the better be prepared for the Consideration of the Houses." The Earl of Newcastle; not agreed to upon the Question. Sir Marmaduke Langdaile; not agreed to upon the Question. Mr. David Jenkins; not agreed to upon the Question. Sir John Winter; not agreed to upon the Question. Resolved, That this House doth not adhere to the former Four named to be out of Pardon, videlicet, Lord Cottington, Sir Rob't Heath, Sir Charles Dallison, and Sir George Ratcliffe. Sir George Ratcliffe; not agreed unto upon the Question. A Pass granted to Mr. John Yaxley, to go to the King, in the Isle of Wight, to be touched. Another Pass granted to Sir Geo. Melvile Knight, with his Servant Stephen Smith, Horses, and necessary Accommodations, to pass from hence, to the Isle of Wight, and to return. Ordered, That Doctor Aylett give Institution and Induction unto Thomas Grigson Clerk, Master of Arts, to the Rectory and Church of Panton, in Com. Lincolne, void by Cession last Incumbent; Salvo Jure cujuscunque: Dame Lucy Grantham Widow, Patroness. 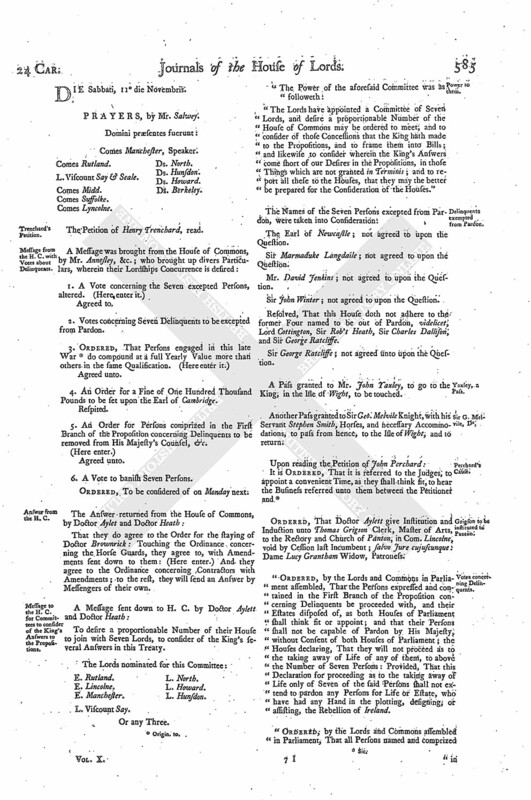 "Ordered, by the Lords and Commons in Parliament assembled, That the Persons expressed and contained in the First Branch of the Proposition concerning Delinquents be proceeded with, and their Estates disposed of, as both Houses of Parliament shall think fit or appoint; and that their Persons shall not be capable of Pardon by His Majesty, without Consent of both Houses of Parliament; the Houses declaring, That they will not proceed as to the taking away of Life of any of them, to above the Number of Seven Persons: Provided, That this Declaration for proceeding as to the taking away of Life only of Seven of the said Persons shall not extend to pardon any Persons for Life or Estate, who have had any Hand in the plotting, designing, or assisting, the Rebellion of Ireland. 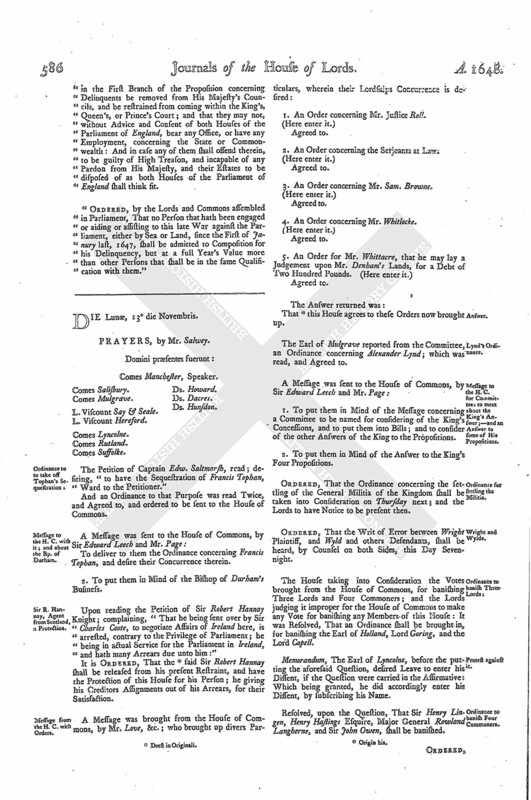 "Ordered, by the Lords and Commons assembled in Parliament, That all Persons named and comprized in the First Branch of the Proposition concerning Delinquents be removed from His Majesty's Councils, and be restrained from coming within the King's, Queen's, or Prince's Court; and that they may not, without Advice and Consent of both Houses of the Parliament of England, bear any Office, or have any Employment, concerning the State or Commonwealth: And in case any of them shall offend therein, to be guilty of High Treason, and incapable of any Pardon from His Majesty, and their Estates to be disposed of as both Houses of the Parliament of England shall think fit. "Ordered, by the Lords and Commons assembled in Parliament, That no Person that hath been engaged or aiding or assisting to this late War against the Parliament, either by Sea or Land, since the First of Janury last, 1647, shall be admitted to Composition for his Delinquency, but at a full Year's Value more than other Persons that shall be in the same Qualification with them."